Saturn on 25 March 2005. Image by Alan Friedman. Have you found the bright wandering star in Leo? Riding the ecliptic near Regulus, Saturn is now prominent in the eastern evening sky as it heads to opposition February 10th. It will move slowly eastward, remaining the brightest star in Leo for the next two years. My first glimpse of the ringed planet through a friend's telescope many years ago got me hooked on this hobby. Decades later, an encounter with Saturn on a steady night still takes my breath away. 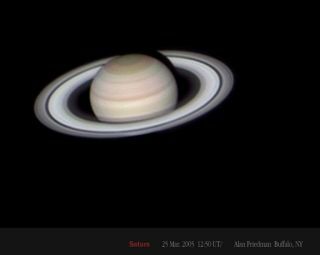 For the astrophotographer, a sharp and detailed image of Saturn is a prized and elusive catch. The ringed planet is a tough subject, revealing its treasures only in good conditions. The delicate disk bands and concentric minima in the B and C rings demand smooth, well-collimated optics and steady seeing. You also need to shoot at high magnification (a long effective focal length.) Saturn is small, spanning 45 arcseconds across the rings with a disk only 20 arcseconds in diameter. The Cassini division, a gap large enough for our moon to pass through, measures a scant arcsecond at best. This represents a speck about half the width of a red blood cell at the focal plane of a 4" f6 telescope! And the holy grail of Saturn imaging, the razor thin Encke gap, is much smaller. Though beyond the theoretical resolution of amateur scopes at a twentieth of an arcsecond, the very best images will show its location in the outer region of the A ring. Saturn with major rings and division labeled. As a final step, image processing with software tools such as wavelets and unsharp mask can be used to increase contrast in the image. Your personal taste and end purpose will guide you here. I prefer a natural feel and so I use a restrained hand with these tools. Overdoing it will introduce artifacts in high contrast areas of the image - along the edge of the disk and in the rings and ring gaps. It will take practice, but a detailed image of Saturn with its glorious ring system etched against the velvet blackness of space is a prize worth the effort.